To my knowledge, Murder at Black Lake is the first title I've read by Anne Patrick and, without a doubt, I will be reading more of her books in the future. As a young girl, Jamie had two parents - an alcoholic mother and a father who was not only dedicated to his job but used it as a way of escaping a drunken wife. However, when circumstance allowed it, Jamie and her father enjoyed camping - until the last trip when she witnessed her father's brutal murder. Life changed after that - not only because Jamie had lost her father but it changed something monumental in her mother's heart as well. It was only a matter of time before Jamie was sent away to live with her grandmother. Years later, Jamie is back home clearing up her deceased mother's estate. However, events happen which cause her to believe her first impressions were true, that the wrong man was convicted of her father's murder. Gage had been Jamie's best friend throughout most of her childhood, and their friendship picks up where it left off several years earlier; he and his sister stay as close as they can, hoping to protect her, as the enemy draws closer and becomes even more deadly. This was a refreshing story to read and, though it's classified as being Christian fiction, it's not a preachy type of book. It's wholesome in its story-telling and, though some of the crimes are mentioned, they are not shared in graphic detail. There are no sexual encounters, yet the chemistry which develops between Jamie and Gage leaps from the pages. What I found most enjoyable was the journey Jamie began to take emotionally, starting from the moment she arrived back home in Jackson Ridge. As the story unfolded, she learned about a few secrets, some of which she would probably have preferred not to have discovered. However, I witnessed how the views she held of her mother changed, saw the transformation as she, finally, learned the truth behind her mother's actions which had devastated her throughout her life. This toppled the scales for me. As anyone who is familiar with me knows, forgiveness is a vital part of my psyche. I learned a long time ago that, if I don't forgive someone, the only person I'm hurting is myself. Truth be told, even though I'm not a vain person, I like myself a little too much to cause myself such pain and anguish by holding onto negative memories and events from the past, but I digress. Anne Patrick certainly knows how to spin a tale and draw the reader into her spider's web. Murder at Black Lake was among my top picks of 2016 so it goes without saying it comes highly recommended by Budden Book Reviews. 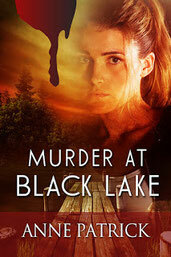 If you would like to read the reviews or learn more about the book, be sure to visit Murder at Black Lake on Amazon.